Today is "one of those days". I don't know exactly what it is about today, but I woke up and as soon as I left my bedroom it seemed that things weren't going right. One little thing after another (the bathroom door was locked when I wanted to get in, I made the girls' lunches and then remembered that I had already made them last night, so I had an extra lunch for each girl in the fridge and today is Friday so that doesn't even help me.. bagged lunches on Saturday I guess?... the girls didn't get ready or listen to my instructions as quickly as I wanted, my hands were particularly sore this morning, the dishwasher still wasn't finished being cleared after asking someone to do it yesterday... those sorts of things. All very little things, but for some reason, I seemed to be more sensitive to them and by the time the girls were on the school bus, I was ready to cry! Do you have days like this? Well, things are getting better now and it will surely be a nice day in the end. 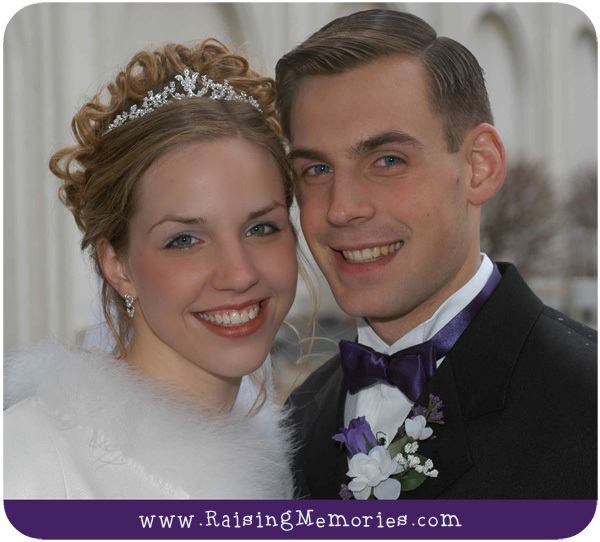 Today is a special day after all, because it's our 11th Wedding Anniversary! I can't believe that day was over a decade ago! In other good news, the finalists for the MiB Canadian Blog Awards were announced last night and I was so excited to see that this blog has made it into the top 10 finalists in BOTH of the categories it was up for! I didn't know what my chances were, so I was thrilled when I scrolled down the list of great blogs to find mine included! I wanted to say thank you to everyone who voted for Raising Memories! The final decision for the winners will be made by a jury, so it's out of our hands now :) I'm just thrilled to have made it this far, but I'm excited to see what happens in the end. There are a lot of great blogs that made it to the finals and it's fun to check them out and discover the ones that I didn't know about! If you want to check them out, just click on the buttons below to see the other blogs that made it to the finals in each of those categories. I totally have one of those days - I think mine was yesterday. Kept dropping things and tripping over things and I just couldn't get my day organized. But I'm so glad it was quickly replaced with some nostalgia of your beautiful wedding day. What a gorgeous pair you two are! Happy Anniversary. AND CONGRATS for being a finalist in BOTH categories!!! YOU GO GIRL!!! Well deserved! Happy 11th anni!!! I hate those days! !I feel like trying to stay on top and I keep drowning!! Good luck and happy anniversary. I'm so happy for you! I voted for you at least once, maybe more? I don't remember! lol Thanks for the Thanksgiving wishes too. It was a fun day. We fed 2 of the six missionaries from our ward, and my apple pie crust turned out flaky and perfect. It doesn't get better than that! Congrats on you anniversary too. It's amazing how time flies, isn't it? I hope that your weekend is fun and that everything smoothes out! Thank you so much! Sounds like a lovely Thanksgiving :) It is very crazy how time flies. Thank you so much for your kind comment! I have those days a lot :( Happy Anniversary and congrats on making top 10! Good luck with the jury vote. Congratulations on your 11th wedding anniversary! Great photo of you and your husband. I'm sorry that your day didn't go well, but it just makes one more appreciative of the good days. Congratulations on your blog nomination, by the way! Thanks Jenna :) You're right, it really does! Way to go on a happy lovely 11 years, and a big way to go also for making the rounds of the blog nominations. Have a wonderful day and I love your wedding pictures, happy smiling. happy anniversary! it looks like it was a winter wonderland sort of wedding.